Give Aggieland Outfitters in College Station props for capitalizing on the Seattle Seahawks run to the Super Bowl. The week after Seattle clinched a spot in the Super Bowl, the bookstore unveiled a new t-shirt touting A&M as "The Original 12th Man." The back of the shirt, which has been a big seller, says "A Tradition About More Than Just Noise," taking a jab at the Seahawks, who adopted the 12th Man moniker. The team pays A&M for the right to use the 12th Man name, which the school has trademarked. "They’ve been very popular," said Dallas Shipp, the store’s director of marketing and communications. "It’s an issue that Aggies are passionate about. It’s an easy way to express that passion." 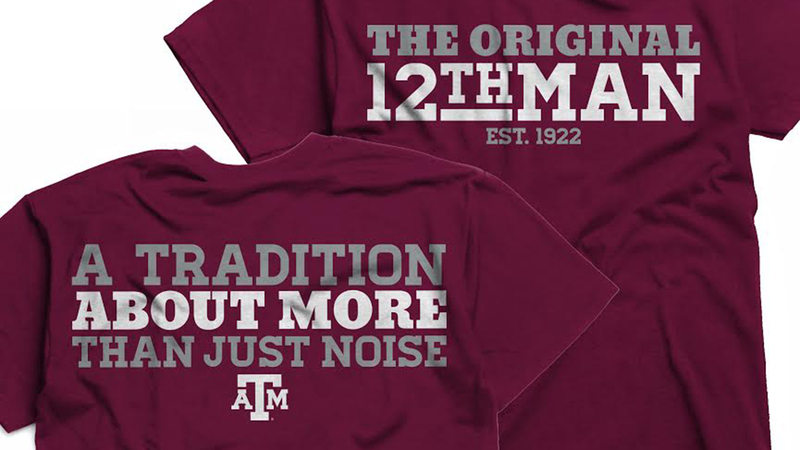 Aggieland Outfitters isn’t the first A&M entity to send out reminders of the origins of the 12th Man. During the NFC Championship game, the school sent out several tweets its official account with different mentions of the 12th Man and Texas A&M. Former Texas A&M quarterback Johnny Manziel also referred to A&M as the "REAL 12th man" on his Instagram account. Aggieland Outfitters is also the same bookstore that was selling "Keep Mack" shirts last fall when the University of Texas began its season with a 1-2 start. Shipp said sales of the 12th Man shirt have blown the Mack Brown shirt sells out of the water.